Zoom in on the action and capture every moment. The Sony Cyber-Shot DSC-RX100 VI features an impressive 24-200mm f/2.8-4.5 high magnification ZEISS Vario-Sonnar T* zoom lens, yet sacrifices none of the pocket-size portability, speed capabilities and high image quality that has become the hallmark of Sony's RX100 lineup. 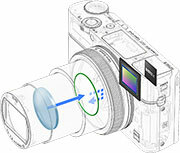 The 1" (1.0-type) 20.1MP Exmor RS stacked CMOS image sensor with DRAM chip and an upgraded BIONZ X image processing system with a front-end LSI maximizes processing speed and optimizes image quality in all shooting environments, while the incredibly efficient Fast Hybrid AF system with 315 focal-plane phase-detection AF points can acquire focus in as little as 0.03 seconds and shoot at up to 24 fps at full resolution with continuous AF/AE tracking and produces beautiful 4K video with full pixel readout and no pixel binning. 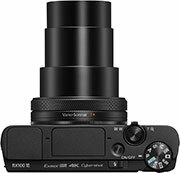 The RX100 VI features a new high magnification 24-200mm f/2.8-4.5 ZEISS Vario-Sonnar T* lens that packs the power of both 24-70mm and 70-200mm lens into a singular compact design. This is achieved thanks to its unique design featuring two ED (extra-low dispersion) aspherical glass elements and eight aspherical lens elements including four AA (advanced aspherical) lenses that work together seamlessly to deliver outstanding sharpness and image quality, from corner-to-corner at all focal lengths. The wide aperture throughout the zoom range delivers beautiful background defocus while the Optical SteadyShot image stabilization significantly reduces blurring. In addition to the high magnification 24-200mm ZEISS lens, the RX100 VI features Clear Image Zoom that lets you further enlarge the center of the image digitally, up to twice as much (400mm equivalent), with almost no image degradation. 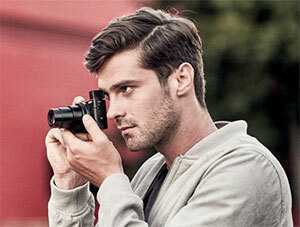 The RX100 VI brings a new level of AF performance and speed to compact cameras. It's equipped with the world's fastest hybrid autofocus system that combines the respective advantages of focal-plane phase detection AF and contrast detection AF - ultimately enabling the camera to lock focus in as fast as 0.03 seconds. 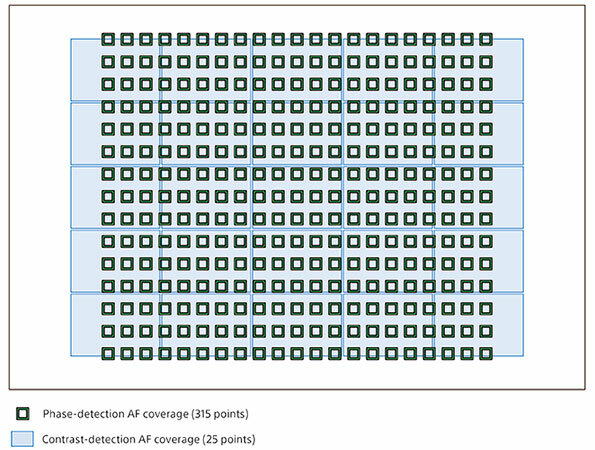 High speed focusing is a perfect complement to the dedicated 315 phase-detection AF points that covers approx. 65% of the image area of the sensor. With such wide-area high-density autofocus coverage, you can accurately focus on and capture your intended subject at high speed, even if it's moving rapidly in unpredictable directions. 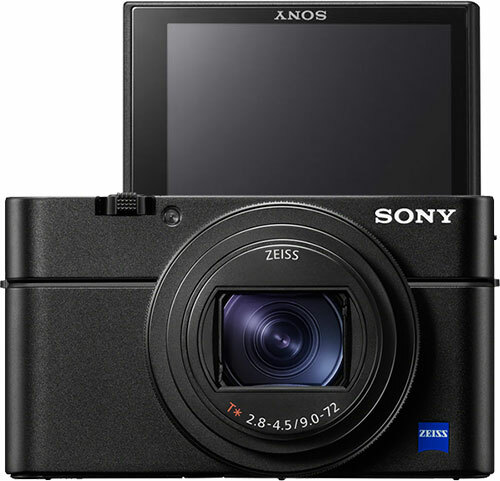 The RX100 VI employs Sony's high-density tracking AF technology to ensure accurate, stable tracking performance throughout the 24-200mm1 range of the lens. This advanced technology leverages the benefits of focal-plane phase-detection sensors to concentrate AF points in a dense pattern around the subject location as its moving to keep subjects in continuous clear focus - even at high speeds. 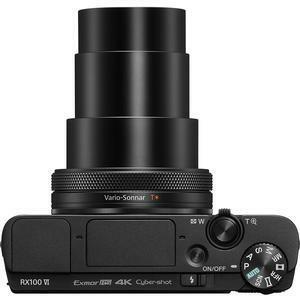 Designed to allow for high resolution, continuous shooting at high frame rates the RX100 VI features a 1" Exmor RS stacked back illuminated CMOS sensor w/ DRAM and front-end LSI that works with the BIONZ X image processing engine to enable continuous shooting speed at impressive 24fps with AF/AE tracking at full 20.12MP resolution. Thanks to a large buffer, the RX100 VI can capture up to 233 images at this high speed which can be viewed immediately after shooting. Viewfinder blackout between shots has been minimized in this high-speed shooting mode, which greatly improves the ability to follow fast action and capture the decisive moment. This large 1" (1.0-type) stacked back illuminated Exmor RS image sensor with DRAM chip not only enhances efficiency and speed of A/D conversion through its stacked structure and more circuit sections; it also realizes super-fast readout speed. Together with the new BIONZ X image processing engine, it allows for stunning 20.1-megapixels at up to 24fps continuous shooting, blazingly fast shutter speed of up to 1/32000 sec., breathtaking 4k movie and super slow-motion HFR (High Frame Rate) movie clip recording of up to 960fps (40x), not to mention remarkable low-light capability with a wide sensitivity range (ISO 80-12,800)6 with reduced noise. 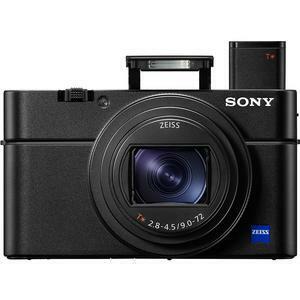 The pocket-size RX100 VI features Clip 4K for short - up to 5 minute - 4K (QFHD: 3840x2160) movie recording directly to SD memory card - ideal for everyday casual use. High quality 4k is achieved by the 1" Exmor RS CMOS sensor with full pixel readout and no pixel binning - resulting in images that exhibit higher resolution and less moire and jaggies than typical 4K movies. Moreover, the XAVC S format is incorporated to maximize high-bitrate shooting up to 100 Mbps for professional quality video. The focal plane phase detection AF system allows for fast hybrid AF during video and ensures accurate focusing and tracking performance, even for the severe focusing requirements of 4K movie shooting. 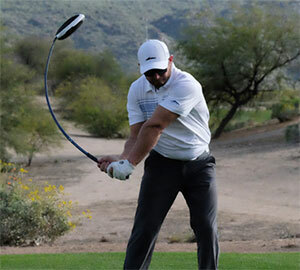 AF drive speed and AF tracking sensitivity can also be adjusted via the menu system providing flexibility for focusing preferences. 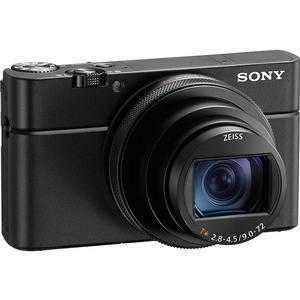 Built-in Optical SteadyShot image stabilization technology - developed exclusively by Sony - prevents image blurring that can occur from hand-held still and movie shooting, especially in low light or at the far telephoto end of the zoom range. Image stabilization is equivalent to a faster shutter speed of 4.0 stops8 at 200mm telephoto, and ensures smooth, stable framing and excellent image quality. Selfies have never been easier with a beautiful 3" (921k dots) LCD Display that rotates in multiple angles. This also makes it easy to photograph over crowds or low to capture pets eye to eye by swinging up approx. 180-degree and down approx. 90-degree. The large display delivers brilliant-quality still images and movies while enabling easy focusing operation. Monitor Auto OFF function boosts max number of still images by up to 30%. Fast, simple, intuitive AF with the Touch Focus function. 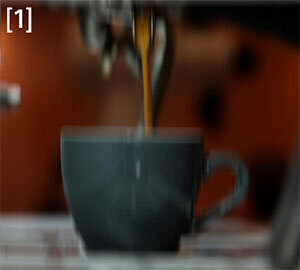 Simply touch the LCD screen at the point in the image where you want to focus when you're shooting stills or movies. When you're monitoring with the viewfinder, the Touch Pad function lets you slide a finger on the LCD screen to shift focus. You can also set preferences according to which eye and hand you want to use and how far to reach your finger. 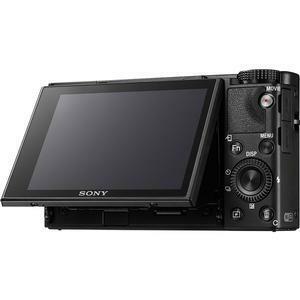 For the first time in the RX series, the LCD monitor now incorporates the Touch Shutter, which allows you to intuitively activate the shutter simply by touching a point on the monitor. This makes it easier to shoot a scene when it might otherwise be difficult to press the shutter button, such as when shooting from high or low angles. The tilt angle of the monitor has also been expanded, so you can tilt the monitor roughly 180-degree upwards and 90-degree downwards, to enable monitoring of the subject for selfies or even when you're holding the camera high overhead above a crowd. The new RX100 VI maintains the convenient pocket-sized design of the RX100 family and is equipped with a high-contrast 2.35 million dot XGA OLED Tru-Finder electronic viewfinder, ensuring true-to-life image preview and playback functionality. With a single push, the EVF conveniently pops-up and automatically extends the eye-piece. 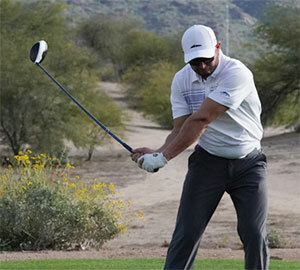 It features optics with ZEISS T* coating that greatly reduces reflections. It has the ability to deliver continuous live shooting at up to 8fps - making it easy to track fast moving subjects. This offers photographers a shooting experience with the immediacy of an optical viewfinder, while still offering all of the benefits of an electronic viewfinder including a live preview of exposure, white balance and several other camera settings. 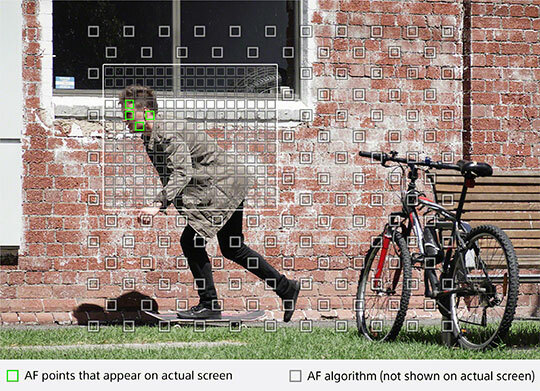 The Eye AF function has excellent tracking performance and a high degree of accuracy and stability as it automatically focuses on a subject's eyes, even when the subject is looking down or away from the camera, or is in backlit scenes when the face of the subject is in partial darkness. The high speed - up to 1/32,000 sec. 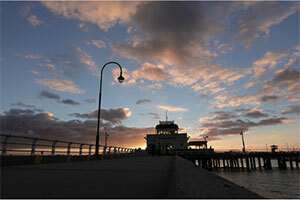 - Anti-Distortion Shutter, minimizes the "rolling shutter" effect commonly experienced with fast moving subjects. This blazingly fast shutter speed also allows the camera to capture sharp, crystal clear images with a wide open aperture at brightness levels. Shooting at wide aperture with fast shutter speed allows photographers and videographers to capture beautiful content with sharply focused subjects and defocused backgrounds under some of the most difficult, bright lighting conditions. The RX100 VI includes professional movie functions such as; Picture Profile, S S-Log3 / S-Gamut3, TC/UB (time code / user bit), Rec Control, Dual Video Recording, marker display function, etc. that have typically been available only in professional video cameras. You also have the choice of region setting between NTSC and PAL movie frame rates. The RX100 VI features 4K HDR thanks to its new HLG (Hybrid Log-Gamma) picture profile which supports an instant HDR workflow. Movies recorded in HDR (HLG) played back on a compatible TV will appear true-to-life, with fewer blocked shadows or blown highlights, without the need for color grading. The BT.2020 color space is supported, providing a wider color gamut. Four gamma settings are provided (HLG, HLG1, HLG2, HLG3). The HLG setting conforms to ITU-R BT.2100. The HLG1, HLG2, and HLG3 gamma settings provide wider dynamic range while retaining the overall appearance of current cameras. The balance of dynamic range and noise produced by each setting is different, allowing selection to best match the scene being recorded. See the unseen with super speed HFR (High Frame Rate). 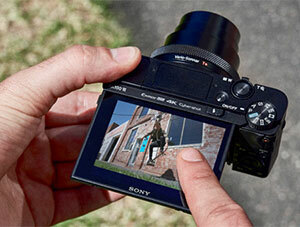 The RX100 VI can capture super slow motion HFR movie at up to 40x slower than real time. 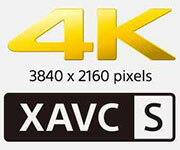 You can chose from 960fps, 480fps or 240fps to playback in XAVC S at 1920 x 1080, in either 60p, 30p or 24p. Choose between "quality priority" (4 sec.). There's also an option to set "start trigger" or "end trigger" which will start capturing movie before or after you press the movie rec. button so you can time those split-second moments perfectly. Clean, uncompressed 8-bit 4:2:2 4K or HD movie signal can be transferred to an external monitor/recorder connected to the RX100 VI via the HDMI terminal. Video can be recorded simultaneously to internal media and uncompressed video to the external recorder in real time. A unique control ring around the lens works in combination with an intuitive, display interface for meticulous SLR-type control over settings that satisfies even the most fastidious users. The control ring can be assigned to adjust various features (at various values) from basics like zooming and aperture to creative functions like Picture Effect. Moreover, it turns smoothly and seamlessly, allowing quiet, click-free usage while shooting movies including a new step-zoom function that enables instant selection of commonly used focal lengths. Easily connect with NFC or QR code (for non-NFC devices) to smartphones or tablets with the built-in Wi-Fi and Sony's PlayMemories Mobile application available for Android and iOS platforms. Control your camera or transfer files to your device for fast and easy sharing without the need of a computer. When you're done, you can use the free software to sort and manage your stills and video with PlayMemories Home or view and edit your RAW file with either Sony's Imaging Edge software or Capture One Express (for Sony). Location Information Link makes the most of the RX100 VI. The camera can be paired with the PlayMemories Mobile app on a compatible mobile device to acquire location data, record it on still images, and correct camera date/time and location. The PlayMemories Home app can be used on a personal computer to organize imported still images on a map. Ratings from 1 to 5 stars can be retained when images are imported into PlayMemories Home or the new Sony imaging software suite running on a PC, and this function and an image protect function can be assigned to a custom button. In-camera ratings and protection can be applied, reviewed, and changed while you're on location or traveling. 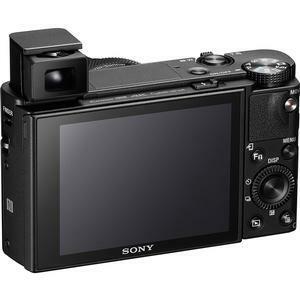 The RX100 VI can be powered via USB connection to AC adaptor, a PC or mobile battery. This conserves the camera's battery, allowing you extended use of the camera without worrying that the battery will run out. When the camera is turned off, the battery can be charged via the same connection. Imaging Edge software suite can maximize image quality, improve production efficiency, and help you finely adjust RAW-based images. Use its "Remote" to remotely control shooting while monitoring scenes via live-view PC screen; "Edit" to develop RAW data into high-quality photos; and "Viewer" to view, rate, and select photos from a list of shots.